Russia-backed militants violated the ceasefire twice over the last day using Minsk-proscribed mortars. Both attacks took place in Luhansk sector, reported Ukrainian Ministry of Defense spokesman on ATO Colonel Maksym Prauta at a press briefing at Ukraine Crisis Media Center. The first attack took place near Shchastia at about 21:00. Russian proxies fired ten 82-mm mortar rounds at Ukrainian troops deployed in the area. “At about midnight, militants fired four 120-mm mortar rounds at Ukrainian positions outside Luhanske,” Colonel Prauta added. Ukrainian troops did not return fire. 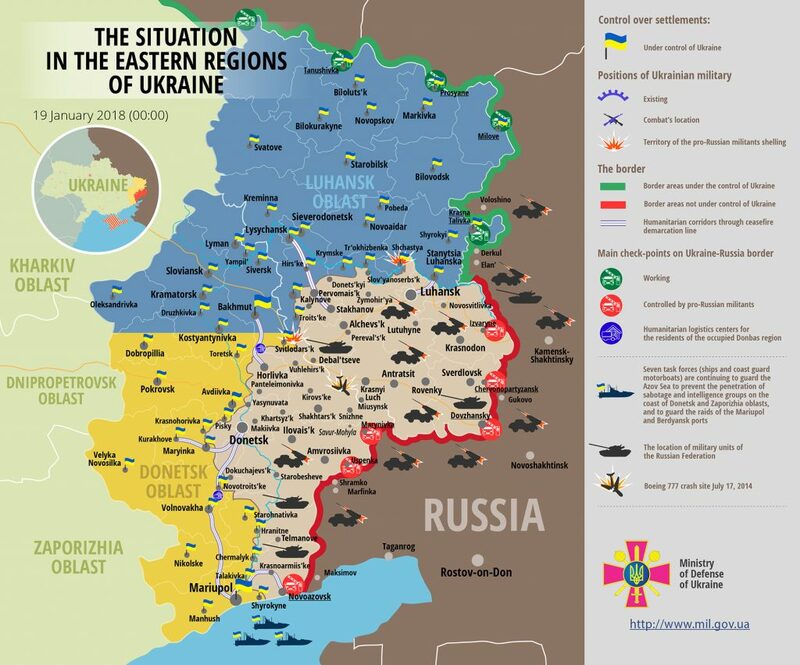 Ukrainian troops did not incur combat casualties over the last day. “However, one Ukrainian serviceman was injured in course of engineering works in Donetsk sector. There is no threat to his life now, his health condition is satisfactory,” the ATO spokesperson said. Report on the military developments as of January 18 is available here. Interactive data on the shelling: chronology shelling chart and the interactive map.